Yarrow is an important diaphoretic herb and is a standard remedy for helping the body deal with fever. It also acts on the kidneys as a diuretic. In these ways it normalizes the distribution, secretion and elimination of water in the body. A cup of hot or warm tea will open the skin while a cold cup may stimulate the stomach, digestion and kidneys. Yarrow has both contradictory and complementary effects on the body, in particular regulating the flow of blood to and from the surface and thinning and thickening the blood. It is also both cooling and warming, fluid generating and controlling. The effects of yarrow are dependent on whether it is used dry, fresh or how long it is infused or decocted for. 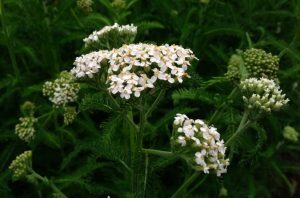 Used externally, yarrow aids in wound healing. Anti-microbial activity has been observed in water and ether extracts of the plant. Yarrow is easily dried by hanging it upside down in bundles. Tincture dosage is 2 to 4 ml three times a day. To make an infusion, pour 1 cup of boiling water over 1 to 2 teaspoons of dried herb and infuse for 10 to 15 minutes. This should be drunk hot three times a day, or hourly for a fever. Drinking a strong infusion on the onset of a cold or flu may help reduce symptoms. Make a first-aid poultice for deep cuts and wounds (but not dirty scrapes that need cleansing first). To make a poultice make a strong tea, using just enough hot water to make a paste. Either soak some muslin in the paste or directly apply the paste to the desired area and wrap with gauze or muslin. Leaving on the area for 20 -30 minutes. Yarrow salve or oil can be rubbed on varicose veins to provide relief. To make the oil infusion, allow the yarrow to wilt for a few days to reduce moisture content and use the oil for daily skin conditioning (but not for dry skin), or for rubbing on varicose veins, bruises or other wounds. Cautions/Contraindications: Yarrow may be too drying to those with dry, cold constitutions and may cause reactions for people with allergies to plants in the aster family.